TICKETS: $10 – $15 general admission for concert and reception. Kids under 12 free. Purchase tickets at the door. Cash only. Ticket sales begin at 12:30 pm. 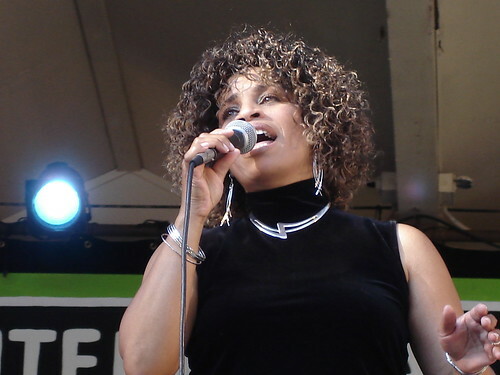 SAN FRANCISCO/OAKLAND – Bay Area vocal artist CLAIRDEE will perform at JAZZ AT THE CHIMES 4499 Piedmont Avenue , Oakland , on Sunday, May 18, 2008 at 2pm. Tickets are $10-$15. For more information, visit http://www.lifemarkgroup.com/oakland/special_events.asp or call 510/228-3218. Clairdee – who describes herself as a “jazz-inspired” storyteller – is a Bay Area jazz artist who has toured nationally and internationally and shared the bill with the likes of Etta James, the Count Basie Orchestra, Gladys Knight, Johnny Mathis, Eddie Henderson and Billy Higgins to name a few. Jazz reviewer Andrew Gilbert writes: With her lustrous voice and soulful delivery, she hearkens back to a time when jazz, pop, and rhythm and blues often blended seamlessly together. Combining scene-stealing charisma with heartfelt humility and a sincere belief in the transformative power of music, Clairdee has honed a repertoire of standards set to state of the art arrangements that are equally smart and entertaining. She appears with pianist/arranger Ken French and his trio. The concert at Oakland ‘s Chapel of the Chimes on May 18th will be followed by an artist reception where the public can meet the artist, enjoy refreshments and purchase CDs. Jazz at the Chimes is a monthly series sponsored by the Lifemark Group Arts program that features Bay Area talent. Concerts are held at the Chapel of the Chimes in Oakland – a designated City of Oakland Landmark designed by Julia Morgan. The Chapel provides a wonderful visual backdrop and acoustic listening venue for live music in a setting like no other. This entry was posted on Monday, May 12th, 2008 at 10:31 am. It is filed under Music News/Info and tagged with Chapel of the Chimes, Clairdee, jazz, Jazz at the Chimes, live music, Oakland. You can follow any responses to this entry through the RSS 2.0 feed.